Simply put, this stone is a large piece of salt crystal, which grows large enough to be cut, polished, or formed into decorative objects. The correct name for it is “Halite”. Halite is rock salt mined from mountainous areas. 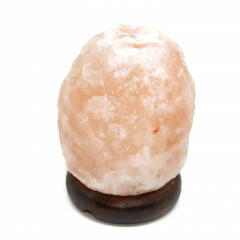 Typically the most well known pieces are known as “Himalayan Rock Salt”, due to crystal healers and new age beliefs – however, it can be found around the world. The salt occurs in a reddish or pink colour, with some crystals having an off-white to transparent colour. It is not a gemstone but a crystalline form of Sodium Chloride which forms in large crystals which can be carved into lamps, tea light holders, and more. It should not be used for jewellery, etc – it is literally salt, and would degrade over time through exposure to sweat, rain, etc. 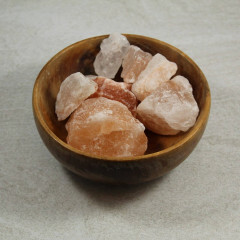 Himalayan salt is packed with remedial benefits, making it a fantastic alternative to table salt and an exciting new essential for your pantry. Treat yourself to a detoxifying Himalayan salt bath and let its nutrients stimulate blood circulation and soothe aching muscles with its 80+ nourishing mineral content. Its the ultimate healing and therapeutic experience for body, soul and mind. 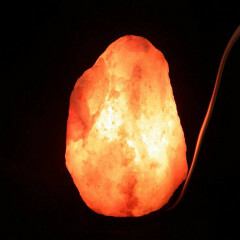 Some people believe lamps and tea light holders made of Himalayan Salt emit a positive charge into the air and help to clean the air around electronic devices, but there is no scientific evidence of this. They are, at least, an interesting object and a beautiful decoration.